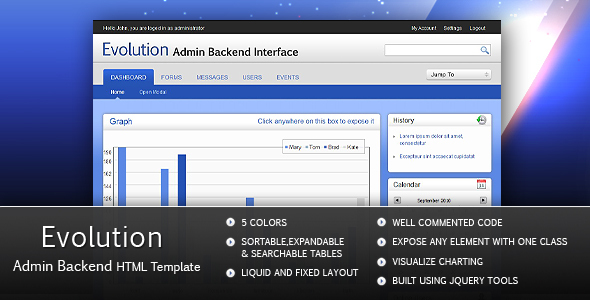 Evolution admin is an advanced admin theme suitable for web applications, prototyping and backend interfaces. It comes with five different colors, working tabs, accordion, lightbox, expose and a lot of other stuff that will help your interface standout, become more usable and flexible. It is built from the ground up using the powerful jquery tools library and validates as XHTML strict. Data Tables can be exported to CSV and Excel. New! Data Tables can be easily printed. New! All images in CSS are now preloaded for faster response. New! Faster performance and page load speeds. New! Referenced the proper charting library on login page. Fixed overlap of notification boxes on accordion. Fixed hover css on vertical navigation in blue theme. Fixed Data Tables resize issue. Multiple data tables can be used on same page. Multiple expandable tables can be used on same page. Multiple accordions can be used on same page. Horizontal tabs are now scripted out of the box. Several tweaks for faster loading and improved performance. All the images in CSS are now preloaded for faster respone. Data tables can now be exported to CSV and Excel format. Data tables can now be easily printed.